A church ornament or devotional object, especially one of little artistic merit; such objects collectively. Religion is a deeply personal subject; art, too, while not quite as inflammatory, is also a matter of some sensitivity. Therefore, any examination of religious art is fraught with problems. 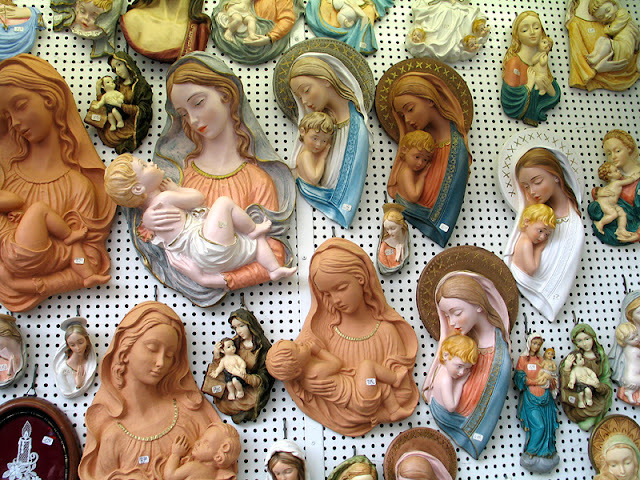 After all, can anyone really say that another's treasured picture or figurine of their Lord and Saviour is, in actual fact, a piece of cheap, tacky, soulless tat? The answer is an emphatic yes, they can, and I present to you a nauseating horror show of bondieuserie, a word that's derived from the French for good and God, which is fitting as "Good God!" is the standard utterance when one encounters and then recoils from such ornamental abominations. If bondieuserie is your thing, of course, then you're in luck. Requiring a minimum of talent to design and only the cheapest materials to manufacture, you can pick up examples at any €2 Shop in Ireland, and many market stalls gleefully specialise in churning out these mass-produced works of horror to the flock (although expect to pay a premium if you're buying them from the church gift shop). As religion is a community affair, you can also take solace in the fact that, if you have been duped out of your hard-earned cash, you're certainly not alone; it's likely hundreds of thousands of similarly gullible believers have exactly the same trinket sitting on their mantelpiece, silently mocking them with their sloppily painted, creepily misaligned eyes. Is it art, bondieuserie, or just unfathomably creepy? And creepiness features heavily in bondieuserie. It's easy to do, of course; religion and religious venues can have a tendency to be unnerving, chilling even. Poorly made artwork, however, is almost unparalleled in its ability to crawl under your skin. I rented a guesthouse in Sligo once, and on the wall in the kitchen was a figure of Jesus on the cross, lit from below by a full-sized red lightbulb. While the intention was surely to be an ever-present reminder that Christ died for our sins, all it did was cast an eerie red glow and cruciform shadow across an already dark kitchen, something that made getting up in the night for a glass of water a harrowing affair. Unable to stomach the constant feeling that I would die violently in that house, underneath that red bulb, at the hands of a maniacally grinning Christian serial killer, I took out the bulb for the duration of my stay. And no, I couldn't just have turned it off; it was hard-wired into the wall, such was the determination of this particular piece of bondieuserie to appall. One has to love the tactful, almost neutral tone that the OED attempts to adopt in defining bondieuserie, describing it as religious art "of little artistic merit." Merriam-Webster is far more blunt, stating that it's "banal and often shoddy". Of course, all of this leaves the question open as to what is bondieuserie and what is genuine, meritorious religious art. All I can say is, with bondieuserie, you know it when you see it. Unless it was the artist's specific intention to nauseate, repulse and horrify, then it's bondieuserie, and if indeed it does leave you muttering "Good God!" rather than "God is good," it's bondieuserie. Are you a fan of bondieuserie? Is there a so-bad-it's-good factor? Can you please explain why anyone would ever allow such travesties of all that is sacred to be displayed in their home? Is it just me or does that look like Justin Bieber trying to fit in at a Guns and Roses concert? Woah, woah, woah! Have some respect, C! I know I rail heartily against bondieuserie in this post, but there's no need to go comparing it to Justin Bieber, man. Not cool! It is all... so... scary o.O Once I went to visit a girl to work on a school project together. 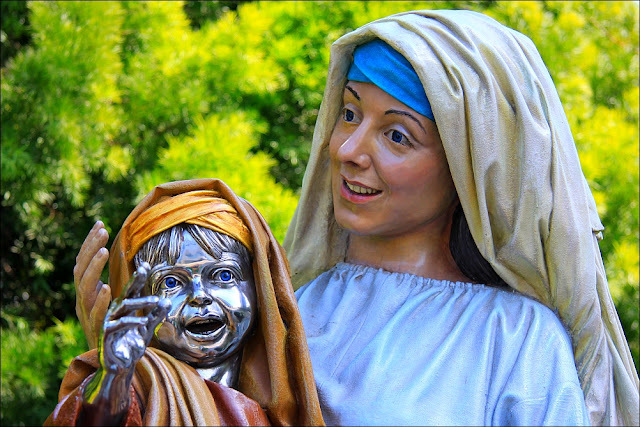 She and her family were very religious (nothing wrong with that, though a little bit extraordinary to most people here) and they had those semi-realistic paintings of Christ and the Holy Family hanging all over their living room. I've never felt so watched in my life. It's the tendency for the eyes to be pointing all over the place - there's nowhere you can stand without falling under their (albeit cross-eyed) gaze. Some wonderful bondieuserie in the airplane episode of Father Ted. Just before he pulls out the holy sellotape dispenser:" You have used 3 inches of sticky tape. God bless you. " By the way, what does sniffing girls' hair have to do with tacky religious art? You have a point there your lordship, however nobody including, I suspect, yourself, knows what it is. Can't even pretend to understand the "Art" and why people want to have such things in their homes. The other day we visitid a Shrine in Portugal and husband said he saw a "thing" of Christ, eyes in red, and painted in the Mona Lisa fashion. You know, wherever you go it follows and stares at you. Why, Mon Bon Dieu?!?!?! Why would anyone do this AND buy it to have in their homes?!?! Your first picture is quite harmless and kind of puerile... the second is a question of not sexualizing it (religious people can - I can - really look and believe in a blessing in it with the child praying and The Lord loving it)... the third well BonDieuSERIE (which has a way os sounding like you're screaming Bon Dieu non stop, piece after piece ahahahah). 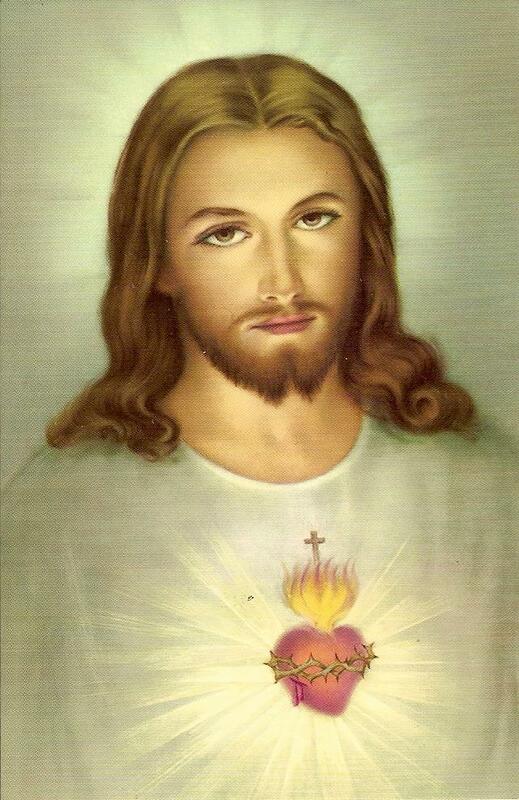 1) It's not the worst example, but as a picture of Jesus it's the type that you see everywhere, usually in cheap printed form, and without any individual artistic merit. Therefore, I would definitely class that as bondieuserie. 2) The second, the stuff for sale on a wall, almost definitely is. I think it would be hard to construct any argument in its defence. 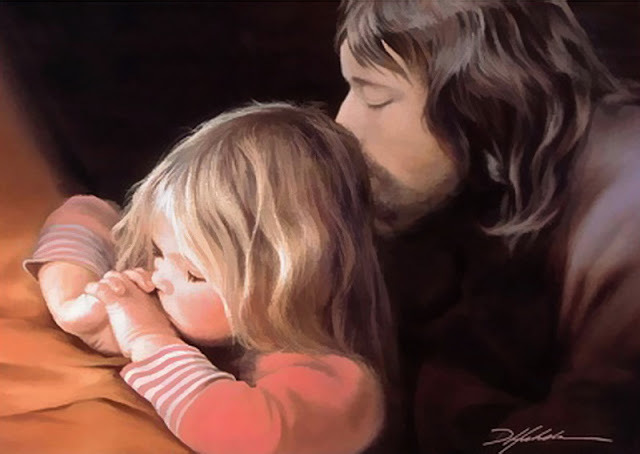 3) There is nothing wrong in the concept of the child praying and Jesus being behind her - however, the execution of that concept is terrible, and it just comes over as unnervingly creepy. 4) The final one - the silver baby! Well it's my favourite, as at least it's original!